Our communication culture has gone through a great development during the last decades. We arrived from the postal mail to the direct communication through the Internet. Today we assume that we can connect and communicate with anyone by only using a computer and an Internet connection. It is natural that in the century of social networks and instant messaging the computer users want to reach all services from their browsers. If you have a company you, of course, want to provide the best solutions to your customers. These two wishes can be easily fulfilled by one ultimate solution that is the webphone. This article assumes that you are familiar with the basic terms of the webphone technology and it will use the sample webphone applications built in the above mentioned guides to show you how easy it can be to put your webphone in your site. Before you start to build your webphone solutions, you will need some programs and SDK support to make your work easy. The sample program, you will see is written in C# language with the use of Visual Studio 2010 integrated development environment. The sample webphone server uses the Ozeki VoIP SIP SDK that is part of the Ozeki VoIP SIP SDK. The Silverlight webphone client is based on the reference Ozeki SLClientSDK.dll that is a .dll for Silverlight client application support. If you do not have these programs and SDK installed it is highly recommended to download and install them on your computer as without these you will not be able to use the sample program. The sample program you will see in this guide is basically the web to SIP Silverlight softphone that was introduced in Silverlight SIP softphone for web to SIP calls guide. There will be some significant changes in the client's side. The client-side application will need some basic changes if you want to use the former sample as you can do that. If you want to create a brand new client-side solution, do not forget to register the Ozeki SLClientSDK.dll to the project and set the server data properly. This guide will show what major changes you will need if you use the previously built Silverlight SIP softphone solution. If you want to build your own application, you will need to check the basic steps in the Silverlight SIP softphone for web to SIP calls page and return to this page when the basic steps are done in that project. The Visual Studio provides a test html and a test aspx page for every Silverlight project. You can choose which page you want to modify when you build the GUI and write the functionality. This sample program has both pages modified the same way so you can use any of them to test the example. The only essential thing to consider is that you will need to write both the GUI and the functionality in the same (or both) page(s) in order to have a properly working application. Cascading Style Sheets (CSS) is a style sheet language used to describe the presentation semantics (the look and formatting) of a document written in a markup language. Its most common application is to style web pages written in HTML and XHTML, but the language can also be applied to any kind of XML document, including plain XML, SVG and XUL. CSS is designed primarily to enable the separation of document content (written in HTML or a similar markup language) from document presentation, including elements such as the layout, colors, and fonts. This separation can improve content accessibility, provide more flexibility and control in the specification of presentation characteristics, enable multiple pages to share formatting, and reduce complexity and repetition in the structural content (such as by allowing for tableless web design). CSS can also allow the same markup page to be presented in different styles for different rendering methods, such as on-screen, in print, by voice (when read out by a speech-based browser or screen reader) and on Braille-based, tactile devices. While the author of a document typically links that document to a CSS style sheet, readers can use a different style sheet, perhaps one on their own computer, to override the one the author has specified. The phone.css file that should be added to your project on the Solution Explorer panel contains the basic settings of the webphone GUI elements. Code 1 shows how you can define a GUI button in a .css file by setting the size, color and other main properties of it. This code segment defines a keypad button with the basic properties. You can define all the necessary GUI elements or even the basic properties of your fonts and texts that are shown on your site. This phone.css only defines the webphone GUI itself. The first basic step in case of the client application is already changed in case of this solution as the GUI itself will be build with a completely other technique. Previously you used the Silverlight GUI tools for your application, now this guide will show you how to get a similar GUI with the use of the HTML tools. The previously used GUI looked like the one in Figure 2. Now this guide will show what html code will ensure a really similar GUI layout for you. You can use the previously defined .css file for this purpose. If you are familiar with the basics of HTML programming, the following section will be a piece of cake for you, but if you didn't write much html code before you will not find it difficult either. The webphone GUI definition will be put into the HTML body and will be defined by <div> tags. The code will define the buttons given the class attribute defined in the phone.css file and set the handler function of the button's click event too (Code 2). Code 3 shows how to define the necessary labels that will show the notification and dialing information on the GUI. Code 4 is an example for defining the main function buttons (Call nad End Call) in the html code. These are also keypad buttons but they have a special ID that is also defined in the phone.css file. As the html language is interpreted sequentially, you will need to define the GUI in the right order in order to get the layout you want. Figure 3 shows how the GUI elements should be defined in order to get the proper GUI shown in Figure 4. 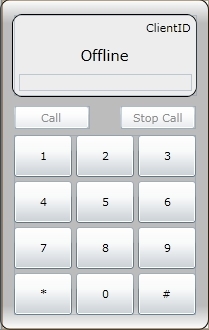 If you want to get a similar GUI layout like the one in Figure 4, you will need to define the phone itself first. The "phone" is a div id defined in the phone.css. 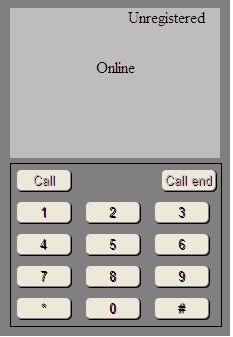 This will be the main panel of the webphone GUI. You will need to separate two main parts of the phone by defining two other div tags "display" and "keypad". These are also predefined div ids in phone.css. The display will need to contain the labels you will use for notification and for displaying the dialed number. These will be needed to define next. The "keypad" div will contain all the keypad buttons that you will need to define in the right order using the "row" div tag class. 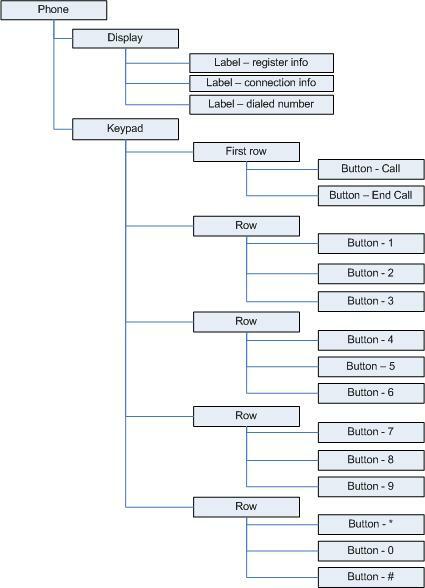 In case of the first keypad row, as it only contains two buttons the phone.css also defines a new id "firstRow" that will set the Call and end call buttons on the right place. You can write a javscript script with the basic functions that will make the GUI work properly. These functions will call the methods that you defined as EventHandlers for the previous Silverlight softphone projects. The onclick events of the buttons were attached to some other event handler functions shown in Code 6. These functions use the formerly written methods you have in your application. As the GUI itself is defined in html, the client-side methods need some basic changes in connection with the GUI elements. This mainly means that the part where you modified the GUI elements like textboxes on the GUI should be changed. The first main additions to the client main class are two using lines that are for the browser access. These are shown in Code 7. The dialing works a bit different from the previous solutions and the EventHandler methods will have different parameter lists. There is a new private property in the main client class that will store the dialed number (dialNumber) in a string. This will be the parameter for some EventHandlers. If you take a look at Codes 8 and 9 you will see the significant but at the same time really basic changes that should be done in the code for having the proper functionality. The two codes are different in the GUI element modification lines that enable and disable the function buttons on the GUI. This solution will be used in case of the textboxes too. When, for example, the former application has set the textbox Text for connection status to "Online", the new application will do it with the code line shown in Code 10. Do not forget to change every GUI element modifications according to this pattern or else your application will not work properly. However, if you deleted all the former GUI elements from the Silverlight panel, the former GUI element references will not be recognized by the Visual Studio, so you will see if you haven't modified some of these settings. There is only one step before finishing this webphone solution that is the Silverlight microphone handling. Microsoft Silverlight has a built-in security policy that requires a direct user interaction in order to have the multimedia peripherals that are the microphone and the camera enabled. This policy can be explained with the protection Silverlight provides the user that nobody could start the camera or the microphone without the user's knowledge. This is an understandable but sometimes problematic solution. In the case of this sample application the problem of microphone access will occur as there is no direct contact between the user and the Silverlight environment. As this sample uses the trial version of the Ozeki SDK, the sample solves this problem to set the Silverlight panel below the pop-up message about the trial version and licensing information and when the user clicks on the OK button, the Silverlight will detect it as a user interaction. If you will use the full version of the Ozeki VoIP SIP SDK, you will be able to avoid this pop-up message and you will need to use some other solution in order to make the microphone enabled. You can put a button on the Silverlight panel that indicates the microphone access, for example. The Silverlight environment can also store the information about the settings of a program, so if the user enabled the microphone once, the browser will most likely store this information and next time the microphone will start instantly. Now you are fully trained and completely capable of creating your own softphone solution that is put on your web site. It is time to take a step forward and find out, what other extraordinary features Ozeki VoIP SIP SDK can provide to you. This article has introduced you how to add a Silverlight SIP softphone solution to your web page. It has shown the basic differences between the former webphone solutions and the methods that were needed in this application. If you have read through this article carefully, you are now familiar with all the necessary tools and methods for having your own webphone solution. Now it is time to explore your further possibilities with Ozeki VoIP SIP SDK and write the solutions that fulfill all your wishes.